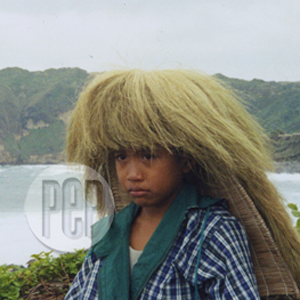 Rico Mark Cardona (in photo) plays the young boy, Peping, who spends time looking for his family’s missing goat (called a "kadin" in the local dialect Isabtangen). Kadin (The Goat) is written and directed by Adolf Alix, Jr. Even before Adolf Alix, Jr.’s film makes its world premiere here in the country, Kadin (The Goat) has already been invited to grace the 60th Locarno International Film Festival in Switzerland from August 1 - 11, 2007. "Kadin (The Goat) has been invited to the 60th Locarno Filmfest this August in the Ici et ailleurs (Here and Elsewhere) section. This new section offers a "choice of films sharing an original vision...powerful works that arouse debate..."
According to the official website of the Locarno Film Festival, the Here and Elsewhere section is a new program that "presents a choice of films, documentaries and fictions, over 30 minutes long, sharing an original vision of contemporary life, which touch on politics and history as much as they do society and the arts. This selection offers an ensemble of event films-powerful work that arouse debate, as well as snapshots of the current world, that function as invitations to reflection and observation of the complexities of the times we live in." Adolf reveals that Kadin (The Goat) is the only Filipino film to be part of the Locarno Filmfest this year. In 2005, Brillante Mendoza’s Masahista (The Masseur) won the Golden Leopard award in the Video Program of the Locarno International Film Festival. Shot in Batanes, Kadin (The Goat) features Ivatans who live in this remote island located in the northernmost tip of Luzon. In the film, Peping (Rico Mark Cardona, 9 years old) and Lita (Monica Joy Camarillas, 10 years old) spend a day searching for their missing goat, which is the family’s source of income. GOOD NEWS FOR DONSOL. In other news, Adolf’s directorial debut Donsol, which was his entry to last year’s Cinemalaya, will also be exhibited in the ASEAN section of the Bangkok Film Festival. This event will take place on July 20-29, the exact dates when the third Cinemalaya will occur in Manila. Right after the world premiere of Kadin on July 21, 6 p.m., at the Cultural Center of the Philippines, Adolf will then fly to Bangkok for the screening of Donsol. While in Bangkok, he also plans to oversee the transfer of his digital film Kadin to 35mm courtesy of Ignite Media. Donsol tells the story of breast cancer patient Teresa (Angel Aquino) and Butanding Interaction Officer Daniel (Sid Lucero). This film, written and directed by Adolf, was shot in the picturesque province of Donsol, Sorsogon.